Just past the first bench on the pond trail, I came across evidence that the beavers are in full prep mode. I saw three trees blocking the path. 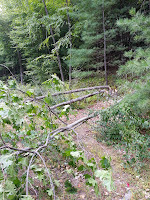 As I came closer to inspect their handy work, I noticed they had actually felled FIVE trees on the north side of the trail. However, they had already dismantled two and a half of them. Their escape route was clearly marked. Further investigation revealed that they had made quick work of at least a half dozen more trees on the southern side of the trail. Walking back home, it became obvious that some of it was put to use on their lodge, and the rest was probably stored for winter feasting. It will be interesting to see how much activity there will be tonight. I didn't have time to set up my trail camera. Maybe the opportunity will arise again soon. I wonder if beaver activity in any way forecasts the severity of the coming winter? 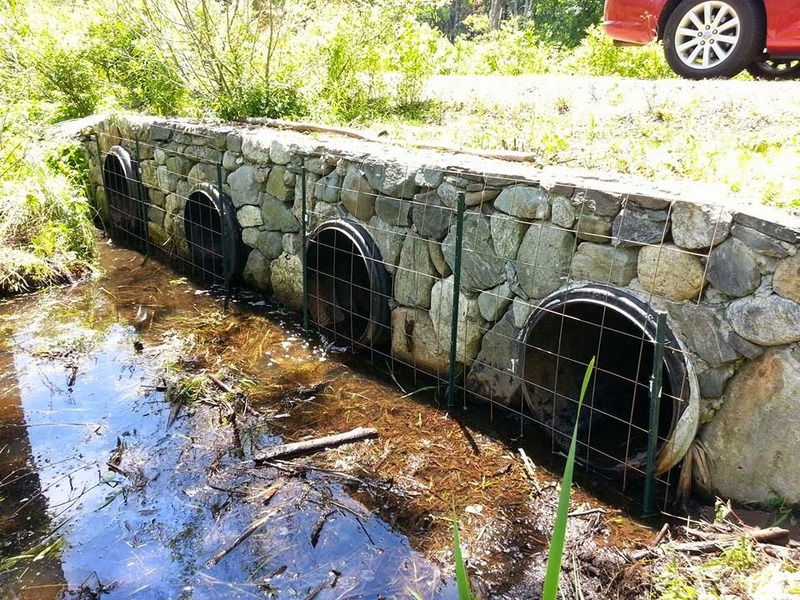 Three years ago, we stymied their efforts to dam the culvert pipes by clearing them and installing a culvert protection cage. This allowed the ponds to level and controlled the flow through the culvert. For three years they weren't bothered by the relatively slow and distant outflow, but this winter's snow has caused another dramatic rise in the pond height with a similar impact on beaver activity. Only now, they are damming the INSIDE of the culvert pipes. So the struggle for peaceful co-existence is on once again. This is something we have to stay on top of until we come up with a solution. More rain means more damming. Dropping pond level will stop the damming. Right now, the last two of the four culvert pipes are clean. Here I am doing my reverse beaver imitation on the first pipe along with some closing commentary from one of the beavers. The Beavers Made a Liar Out of Me! I was concerned that our beaver population had been thinned considerably by predators, but boy was I wrong. 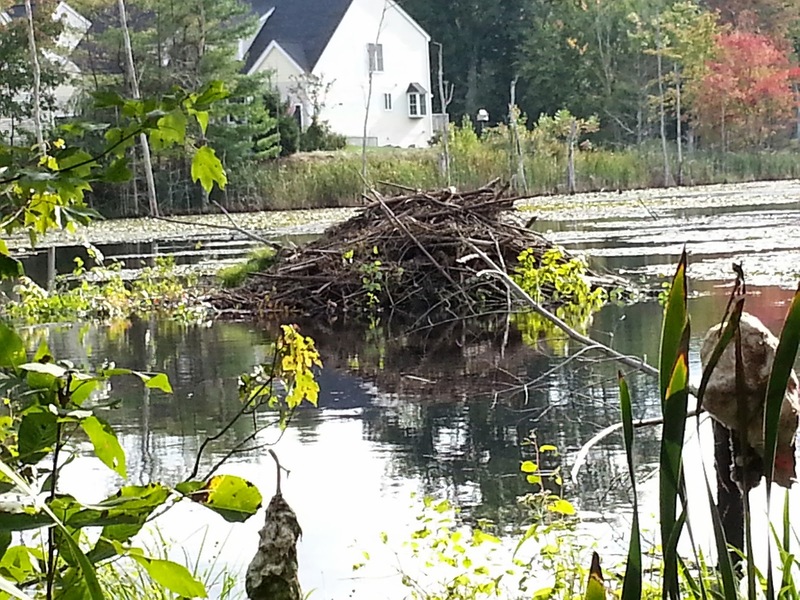 It seems as if there are a LEAST 7 beavers now living on the pond. There is evidence of trees being harvested in a number of places. There is a lot of activity on the far side of the pond where they have built ANOTHER lodge. This one is probably in response to the rising level of the pond. The other hot spot is in the area of the pond visible through the kitchen window of the clubhouse. There is one tree that could be taken down as early as tonight. With any luck, I will have some video of the event. I set out the trail camera to capture the action during the night and will be checking it in the morning. Of course, Murphy's Law could kick in as it did two years ago when they were working on a tree at the beginning of the trail. I had the camera in place for three days. On the third day, at about 10:00 AM, I retrieved it with the intention of getting the shots I had collected over the three days. It was obvious that the fourth day would be the day it was coming down. I took the camera home, downloaded the pictures to the computer and returned to put the camera back in place, only to see that it had come down while I was downloading the pictures. Right now, I have the camera set to take 60 seconds of video when motion triggers it. Then it will wait 10 seconds before more motion can trigger it again. With my luck the tree will come down during that 10 seconds, or worse, the batteries will die and I will get nothing. Only time will tell! What Will Spring Bring for the Beaver(s)? Going into the winter of 2012 our beaver population was five. There were the parents, a one-year old, and two babies. During one of my winter walks around the pond I saw beaver tracks followed by fox track, which worried me. When spring rolled around there were never more than two beavers sighted and I feared the mother and two youngsters became fox food. The two left appeared to be the patriarch and his oldest son. By the end of summer it seemed as if the population had dropped once more as there was never more than on beaver sighted at a time. The winter this year was particularly wet and the spring run off is seeping through the dam in a half dozen places. The west pond higher than it has ever been in the past and the east pond is proportionately as high. If there is only one beaver left, he will be BUSY shoring up the dam. On my last week, I didn't see any early signs of activity, but I did see a couple of mallards swimming around the cage. When we built the cage back in 2011, it was to protect the three culvert pipes the beavers had dammed up. Before we installed the fence, we completely cleaned the lowest of the three pipe and intentionally left two of them about 1/2 dammed up. That way, no water would flow through two of them and we would only have to keep an eye on one pipe. The two partially dammed pipes were a safety valve. If there was a major break in the dam, it would easily push out the partial dam and allow water to flow under the road, rather than over it. It looks like the culvert pipes may need a little attention this spring, because the run off from one major storm last fall and this spring's run off has unplugged both of the partially dammed pipes and there is significant debris at the outflow. We'll have to keep an eye on which flow attracts the attention of the beaver(s) assuming there are any still around. It would be sad if they were not here this summer, but even if that is the case, the situation won't stay that way for long. Beavers control their own population and when youngsters reach as certain age, they are given their walking papers and must find their own home. If we are sans beavers, it is just a matter of time before another one or two set up house keeping. Update: The above material was written about a week ago. Since then I'm happy to report that we have had confirmed sightings of no less than three beavers, one adult and two youngsters from last season. Additionally, if you look around the pond, there is ample evidence of their activity. There are quite a few sapling stumps visible as the beavers dine after a long winter. 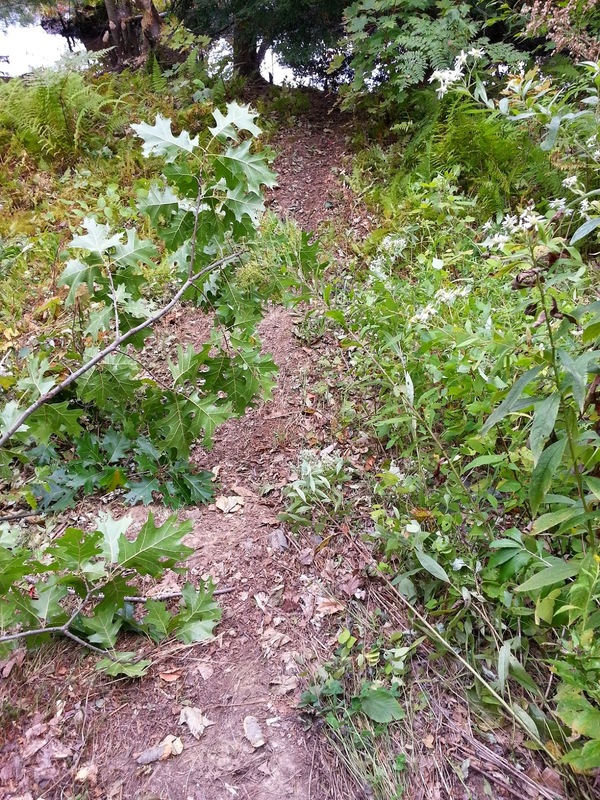 There is also evidence of work on a large tree left, a little distance past the first bend in the trail. 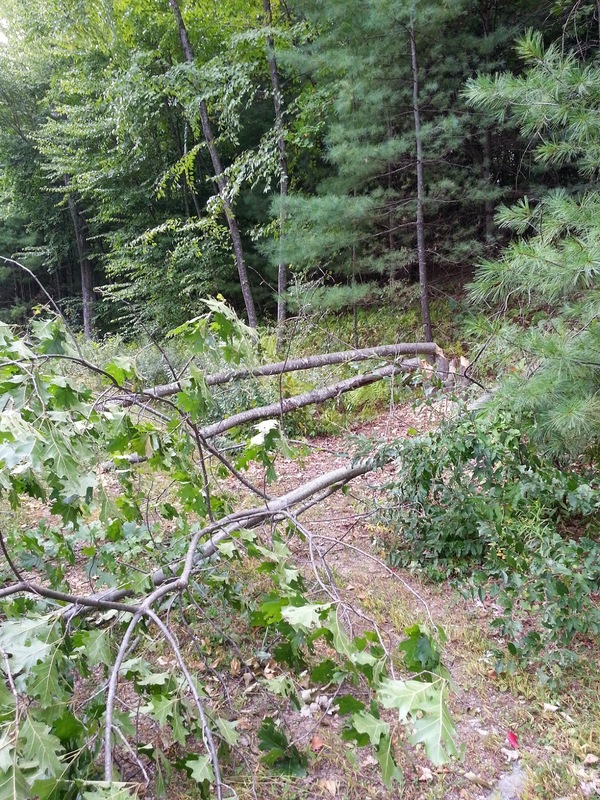 If the continue to work on it, we might have another tree across the trail. They have also made repairs on the dam to stop some of the leaks. As yet, they have made no attempt to dam the outflow side. We will keep tabs on them and report any new information. If you have any sightings or get any pictures, please send them my way.